“The Videlo Globe was a most enjoyable event and Frensham Pond is a great venue”. This was the comment from one of the top Footy sailors, who had not been to Frensham Pond Sailing Club before 12 competitors representing 7 clubs from 3 MYA districts enjoyed a really good day’s racing at this event organised by the FPSC Model Yacht Group. 19 races were sailed in near-perfect sunny conditions in a small buoyed off area between the jetties were Phantom and Lark dinghies were launched for their open meeting in the main part of the lake. The wind was frustratingly variable in direction, between west and north-west and also variable in strength, permitting the biggest rigs to be sported occasionally and the next one down to be in use for most of the time. PRO Roger Stollery set a simple windward/leeward course with a leeward gate and separating mark after the windward mark. Two laps gave an average race time of 8 minutes. With the wind direction being variable, the start line was between a mark and a post on the bank, which was moved to give as far as could be achieved, a fair start without bias. Racing started well for Peter Jackson sailing his ‘SLIM’ Footy with a couple of wins before letting Hugh McAdoo and his ‘ICE’ win Race 3. In that race young Rory Burdock, a helm from the FPSC Cadet Squadron, who had not sailed a Footy before made a brilliant start at the port end and led the race to the windward mark, but then his inexperience gave him some trouble tacking in the stronger gusts. Peter Shepherd with another ‘SLIM’ had been very consistent with a couple of seconds and pulled a win out of the bag, but then let Hugh win again in Race 5. These 2 would be chasing each other for the lead throughout the event. However it was Peter Jackson, who got another bullet in Race 6, before letting David Wilkinson with his own design ‘IAMBUS 2’ get a well-deserved first place after a run of 5 third places. Hugh then took the next 2 races before lunch and went into a joint overall lead with Peter Jackson on 27 points with Peter Shepherd third on 30. After lunch, Hugh carried on his winning ways for a couple of races, but then had a bad race allowing Peter Shepherd to gain momentum in Race 12 with Peter Dunne sailing a ‘SUPABUG’ second. At this time the wind was at its most variable dropping to nothing at times and Rory sporting a big rig, once again demonstrated his good starting technique and pulled out a big lead by the windward mark. He was chased by Hugh, but just held it together sufficiently to cross the line in first place to a big cheer from the spectators. Hugh came back to win Race 15 before having a couple of bad results to let Peter Shepherd mount his final challenge with 2 wins and 2 seconds in Races 16-19 to take the Videlo Globe, regarded as one of the best trophies in the Footy calendar. This trophy was given in memory of Don Videlo, who helped to start the Model Yacht Group at FPSC and the trophy and prizes were given away by his daughter Karen. Peter was delighted to win this event, as this was his first win on the Footy Open meeting circuit outside of the Midlands region and he thanked the model yacht group for organising a very good event at a marvellous venue. As well as the normal prizes there was a special trophy for the first ‘novICE’, the top competitor who had not been recorded in the top 3 in previous Footy open events. This and the Junior prize was won by Rory, who thoroughly enjoyed the day and was sailing at every opportunity, between the races, at lunchtime and after the event! At the ‘tea’ afterwards the discussions covered every aspect of both building and sailing model yachts, including the difficulties that radio sailors have getting cooperation from local authorities and other organisations for allowing and supporting radio sailing on local lake venues. 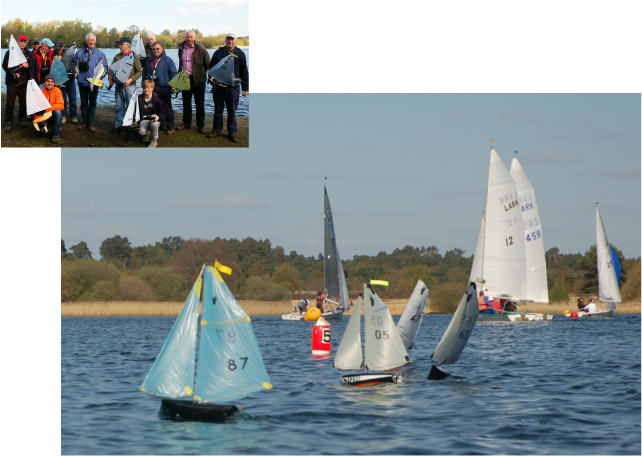 Before this meeting there had been some scepticism about sailing Footys during the dinghy open meetings, but as a result of the small size of the Footy and course required, there was no problem with the biggest fleet of the smallest boats racing together on Frensham Pond.